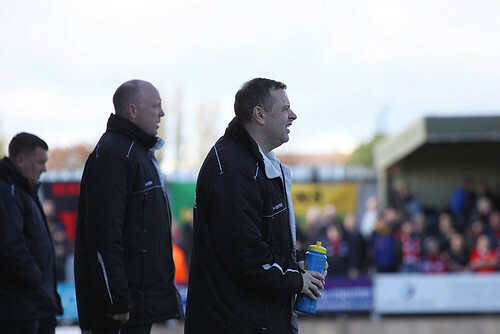 Hednesford Town earned a place in the Conference North after a hard earned 2-1 victory over FC United of Manchester in front of a record crowd at Keys Park, writes Scott Smith. 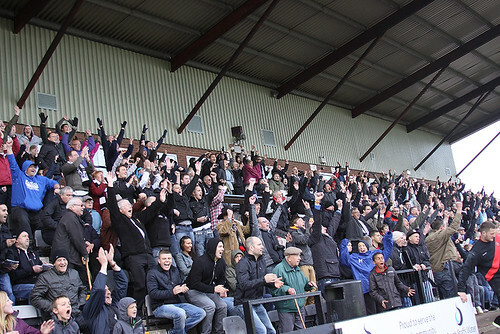 4,412 supporters jammed into the ground to see Hednesford follow North Ferriby United’s lead by gaining promotion to the second tier of non-league football. 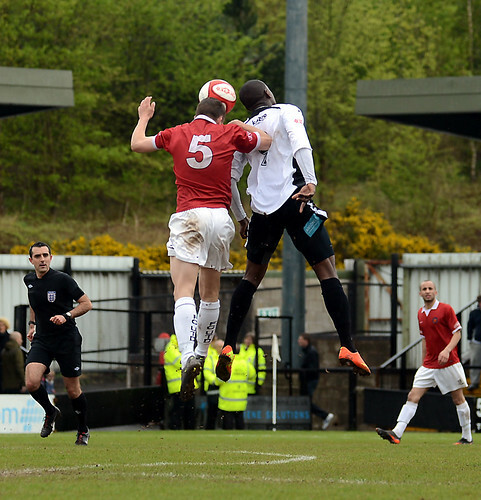 Goals from Neil Harvey and Jamey Osborne in the first half were enough to see Town over the line despite Mike Norton reducing the arrears in the second period, as FC United were made to rue a third straight Play Off Final defeat. 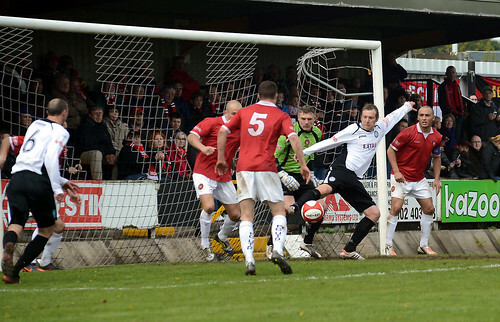 The Pitmen made the perfect start to the game when they opened the scoring after just 88 seconds. Evo-Stik League Player of the Year Elliott Durrell was able to get to the byeline and his low cross wasn’t dealt with, leaving Harvey with the opportunity to slam the ball home. In poor weather conditions both sides failed to really play how they would have wanted with the wind dictating where the ball was ending up on more than one occasion. 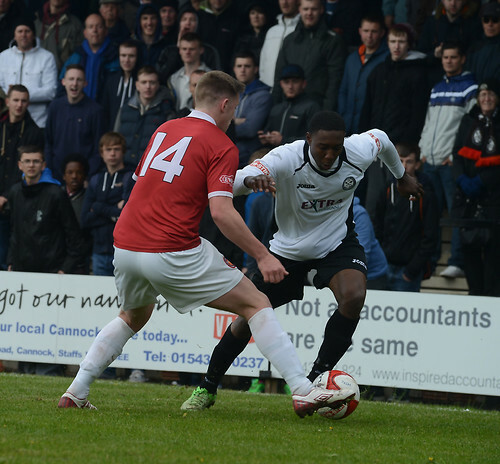 Despite this Hednesford were able to make it 2-0 on the half hour mark. Michael Lennon pounced on a loose ball in the corner and was able to pick out Harvey who in turn set up Osborne to slot the ball into the corner of the net. Keys Park was now rocking, although right on the stroke of half-time things could have been quietened a little had Oliver Banks not blazed over when well positioned 12 yards out. 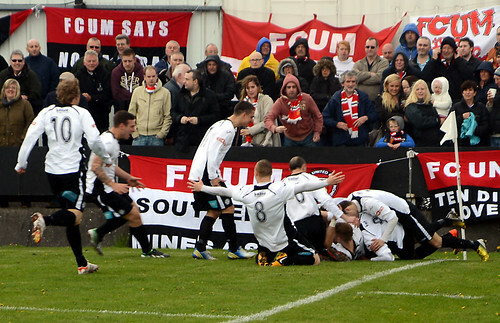 FC did manage to find a way back into the game after 56 minutes though. 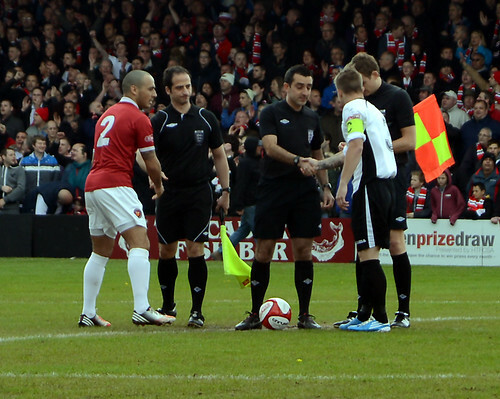 The visitors were able to win a corner and from the resulting flag kick Norton was given all the time in the world to plant a header into the middle of the goal. Hednesford were now on the back foot and just three minutes later Matthew Wolfenden struck the crossbar for FC, whilst on the hour mark Banks drilled a free kick just wide of the Hednesford upright. The game was now end to end and in the 75th minute FC felt they should have had a penalty for an infringement on Norton whilst sixty seconds later Durrell struck the post at the other end following a free kick into the penalty area. 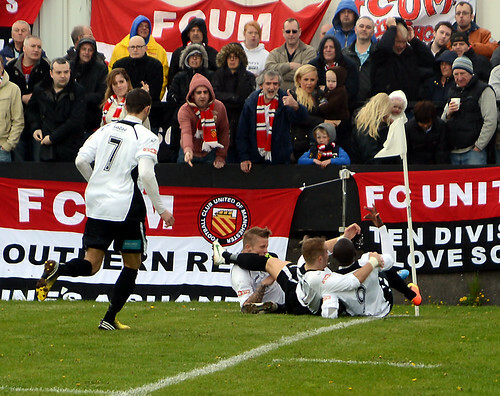 The final few minutes saw few chances for the visitors and it was actually Hednesford who might have extended their lead as first Durrell was denied by Kyle Jacobs before Nathan Woolfe blazed over the bar. As it was though it wouldn’t matter as Town saw out time to earn their place in the Conference North after a fantastic 2012/13 campaign which saw them lose out on the title only on goal difference.